A news conference with the Malaysian transport minister was interrupted this morning with a dramatic note. 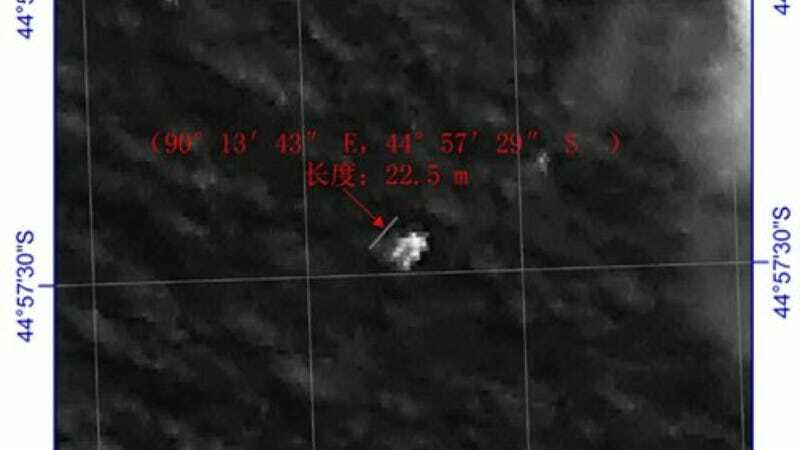 A Chinese satellite orbiting high above the Earth has spotted a possible piece of debris from missing Malaysia Airlines Flight 370. But we've seen this sort of thing before, so just sit tight. Malaysian Acting Minister of Transportation Hismahuddin Hussein was giving his daily update on the ongoing search for the vanished jet, when a piece of paper was given to him by an aide. "But the news that I just received, is that the Chinese ambassador received satellite image of floating objects in the southern corridor. And they will be sending ships to verify." The size of the object spotted was later corrected to 22.5 meters (74 feet) by 13 meters (42 feet), which is still pretty enormous for just a piece of flotsam in the ocean, making it slightly more likely that it's not supposed to be there. Thousands of shipping containers are lost at sea every year, but none of them are longer than 13 meters, excluding one of those at the object. That being said, as of 9 AM EST this morning, planes and ships are en route to investigate what may be a major breakthrough in the investigation of what happened to the Boeing 777. Earlier this week, Australia thought it spotted two large objects floating in the Indian Ocean. By the time planes made the journey out to the remote location, the objects were gone. It will take a few hours just to get there, leaving search aircraft just a small window of opportunity to search before they must return to land. Let's hope, for the families' sake, that this is actually something.